TUCSON — There are food deserts, those urban neighborhoods where finding healthful food is nearly impossible, and then there is Tucson. Eight months ago it became the only place in the United States designated a City of Gastronomy by the United Nations Educational, Scientific and Cultural Organization, known by its acronym, Unesco. A half-dozen years ago, the international agency began including food as a part of cultural heritage worth protecting, recognizing the importance of things like Armenian lavash, the Mediterranean diet and the gastronomic meals of the French. In 2004 the group began a Creative Cities Network to link places where folk art, literature, music and other creative pursuits are being put to use to guide sustainable urban development. In the gastronomy category, Tucson joined 17 other cities, among them Parma, Italy; Bergen, Norway; and Ensenada, Mexico. “They want towns where the designation will make a difference,” said Jonathan Mabry, Tucson’s officer for historic preservation and an author of the application. To an outsider, Tucson’s star turn may be a bit of a head scratcher. Certainly, the city has plenty of reliably delicious tamales, brilliant renditions of huevos rancheros and devoted eaters who will spend the day debating the best place to get a good raspado. There’s even an outpost of Pizzeria Bianco, Chris Bianco’s Phoenix restaurant, which serves what several critics have called the best pizza in the United States. Still, Tucson has never been high on any list of great food cities. Even Santa Fe, its Southwestern-food sister, gets more love. But as people here will tell you, being a great food city is not always about the restaurants. She pointed to strong advertiser and reader support for the magazine as just one example of the love people have for local food in this city of about 500,000. The magazine consistently has more advertising pages than any of the other 90 published under the Edible Communities umbrella in the United States and Canada, said Nancy Brannigan Painter, the executive director of Edible Communities. The Unesco designation has been a rallying point for a city that has to balance an annual influx of snowbirds and University of Arizona students with a substantial Native American community, recent immigrants and deep pockets of poverty. “It gives us a reason to have deeper discussions about food and what it means to everyone who lives here,” Ms. Kimble said. Of the many facets of Tucson food culture included in its 16-page application, one has risen above the rest: the claim that the city has the longest history of agricultural cultivation in North America. Dr. Mabry was part of a team hired by the city that made the discovery in 2000. He was working as an archaeologist, digging not far from downtown Tucson, when they discovered layer after layer of irrigation trenches, then found some charred corn. They sent it to be carbon dated. It was proof, he said, that modern-day Tucson had been built on top of a 4,000-year-old farming village. The fact is now dropped into even the most casual discussions about Tucson’s culinary assets. “It’s like part of the brand now,” Dr. Mabry said. Cooks here make great use of the food that comes from the desert, finding ways to incorporate agave, cactus pads, amaranth and the tiny wild pepper called chiltepin. Mesquite pods are pounded into sweet flour that is baked into cookies. Descendants of fruit trees introduced in the 1600s by the Rev. Eusebio Francisco Kino, an Italian who explored the Southwestern deserts, offer quince, figs and white pomegranates with soft seeds that taste of apple and grapefruit. Cholla buds, the slippery flowers of a cactus that taste vaguely of asparagus, are chopped into salads and salsas. Members of the Tohono O’odham nation sometimes gather them on the San Xavier Indian Reservation near Tucson and dry them, selling the buds in jars and soup mixes at the San Xavier Co-op Farm. A lot of the food from the Sonoran Desert is like that. “I thought it was a wasteland when I first came here, but slowly my eyes opened up,” he said. To celebrate the new designation, Mr. Wilder has spent the better part of the summer at his latest restaurant, Downtown Kitchen and Cocktails, cooking a different menu based on each of the new cities of gastronomy. This week, he’s preparing the food from Phuket, Thailand. Tucson’s passion for its food culture goes well beyond the kitchen. People embrace new ventures and cheer creative solutions to help people eat better. When the lines at the Community Food Bank of Southern Arizona nearly doubled during the economic crash in 2008, the people who run it helped clients build gardens in their backyards and sell extra produce on consignment at the bank’s farmers’ markets. The county’s libraries tuck seed banks into old card catalogs. If you want to plant tomatoes, or the little brown tepary beans that were long a staple of the Southwestern Native American diet (and don’t require much water to grow), simply check them out with a library card. If you save some seeds from your crop and bring them back, all the better. The city’s devotion to creating livelihoods from its heritage foods is part of what appealed to Unesco, said Gary Paul Nabhan, a seed-saving expert who advised the city on its application. Mr. Nabhan, a MacArthur Fellow and director of the Center for Regional Food Studies at the University of Arizona, has written more than 30 books, most of them about the plants and cultures of the Sonoran Desert. Mr. Nabhan, an ecumenical Franciscan brother who helped start Native Seeds/SEARCH, a nonprofit organization that saves and distributes Southwestern heirloom seeds, is a proponent of what he calls desert terroir, and the ingredients that make up what he calls borderland cuisine. One of them is white Sonora wheat, one of the oldest varieties grown in North America. Father Kino introduced it to the Tohono O’odham farmers, who welcomed it as a winter crop and used it to make the precursor to the thin, stretchy wheat tortilla that is the foundation of Mexican border cooking. 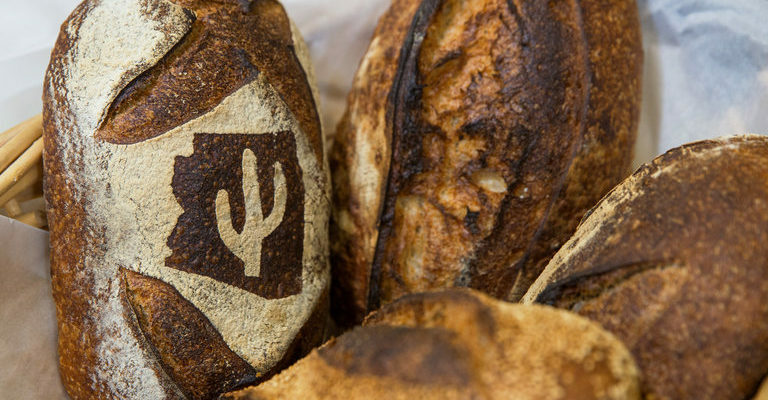 Don Guerra, a cult star among the nation’s slow-fermentation bread bakers, uses it in the loaves he bakes in an Italian deck oven he installed in his Tucson garage. His community-supported bakery, Barrio Bread, produces 900 loaves a week for people who order it online. But Tucson will always be Tucson, a place people either love or hate.